Skills and abilities: She has a mastery of technology. Equipment: She has to an exoskeleton which she helped create, presumably it has grants similar powers to the original Sentinel armor. those of flight, superhuman strength and Speed. The armor may also be able to generate Force fields and energy blasts. Kiesha Langston is the younger sister of the original Sentinel Marcus Langston. She was chosen as the latest person to wear the Sentinel armor to appeal to the African American and female voting demographic by the Barack Obama administration. 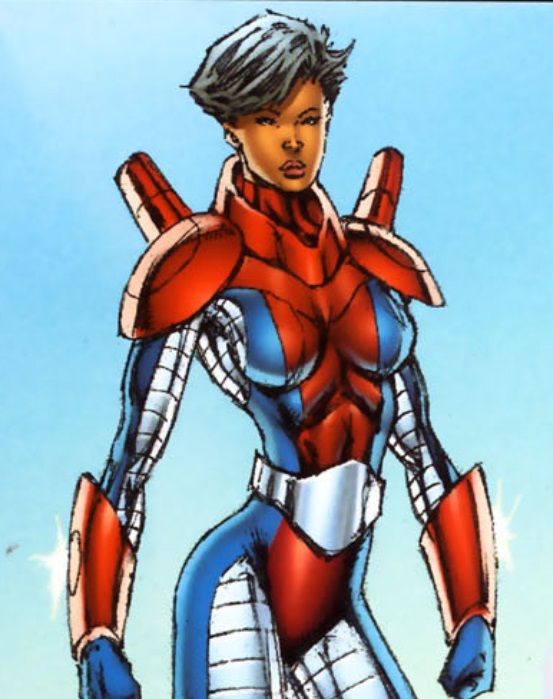 She was deemed “uniquely qualified” to pilot the Sentinel Armor because she helped design and create it [Youngblood #8, 2009]. She joined the newest rendition of Youngblood because of her desire to restore the legacy that was lost due to her brother Marcus‘ unfortunate breakdown [Youngblood #8, 2009]. She was well received by her teammates who were all eager to see her succeed. Lady Sentinel later makes an appearance at a press conference hosted by president Barack Obama where he announced the line up of the latest Youngblood team. She has not appeared since [Youngblood #8, 2009].